Two-Face thinks he can turn everyone in Gotham City and the surrounding state into a greedy no-good criminal lowlife with the promise of cold, hard cash and the threat of suddenly revealed secrets. He’s probably right. I’ve always thought that Two-Face was second only to the Joker in Batman’s rogues’ gallery. His past as a mob-busting district attorney and mania for duality made him sympathetic in a way that other rogues weren’t. There was always a coin-thin sliver of hope that psychological and physiological rehabilitation could restore the good man that Harvey Dent used to be. That hope is the main concern for a new storyline focused on Two-Face in All-Star Batman #1, written by Scott Snyder, with art by John Romita, Jr., Danny Miki, Dean White, Steve Wands, Declan Shalvey, and Jordie Bellaire. This debut issue revolves around a video message that Harvey Dent sends to Batman. The video instructs Batman to take Two-Face to a house 500 miles from Gotham where Harvey’s affliction will supposedly be cured once and for all. But the evil half of Dent’s split personality has other plans. When he was still DA, Dent set up information-gathering technology to monitor criminal activity in Gotham. He’s got dirt on underworld potentates and regular folks alike. In order to prevent Batman’s arrival at the mysterious house north of the city, Two-Face broadcasts a bounty that simultaneously threatens blackmail and offers up vast riches to anyone who takes out the Bat. Once mysterious assailant shoots the Batplane down, super-villain assassins start swarming on the small town where Batman and Two-Face take refuge. 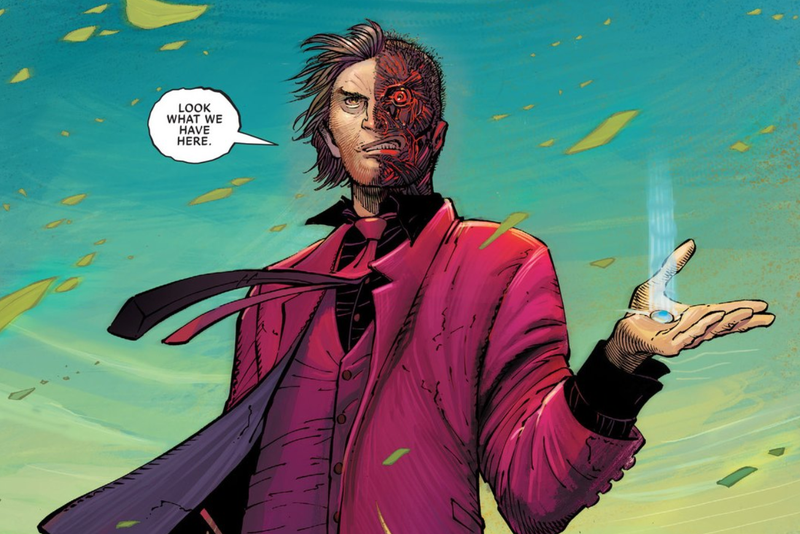 The gambit is actually one huge coin toss for Two-Face. His running argument while held in captivity by Batman is that most people will unleash the inner villain lurking inside, provided they get the right motivation. Batman believes otherwise, of course. I really enjoyed this first issue, which works as a a energetic set-up aimed right at the thematic allure that Two-Face has had over the decades. Part of the tragedy of Harvey Dent’s transformation into Two-Face was how the darker aspects of a good man were unleashed by disfigurement. He had seemingly no choice after the acid burned his face. The people he’s tempting do have a choice, and perverting them into lesser versions of himself is one of the most evil things this long-running villain has ever done.